Podcasts are a super convenient and portable way to broaden your knowledge and understanding of business. Here are our top picks for the most innovative, informative and insightful free business podcasts! 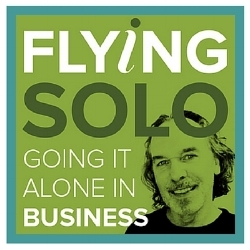 The Flying Solo podcast is a show for those starting or growing a small business. Host Robert Gerrish talks with inspiring soloists and expert guests on all things solo, micro and small business. A podcast hosted by two savvy businesswomen discussing and sharing their story. Jemimah and Shevonne decided it was time someone got real about what it’s like to be in business. Some of the industry’s best innovators, entrepreneurs and business researchers share their stories and insight from TED conferences. HerBusiness (formerly Australian Businesswomen’s Network) is a membership community that provides education, training, resources, mentoring and support for women who want to be inspired to start and grow their business to create a business and life they love. Part of MarketingProfs, Marketing Smarts offers real world education for modern marketers through training, best practices, research and other content. Weekly podcasts will feature in-depth interviews with marketers from all walks of life delivering insights and real advice to market smarter. Aimed at fellow business addicts, this podcast is designed to inspire others to create a life that they love, rather than be controlled by it. Providing advice on strategies, tips and tools; Loren and Fiona want to provide valuable content that will help improve your business and life. Small Business Big Marketing is one of the most listened to marketing podcasts in the world. Tim Reid, a small business specialist talks about practical marketing tips and tricks, interviews successful business owners and answers listener questions. Total Retail provides invaluable insight into decision making by global retail giants including eBay, PayPal and Patagonia. A go-to source for marketing, e-commerce, operations and management. The Entrepreneurs Radio Show highlights podcasts with self-made millionaires and high level entrepreneurs. Conversations centre around making money from your passion, business direction and growth. Startup is a podcast exploring getting a business off the ground. Gimlet was founded in 2014 and aims to help listeners better understand the world and each other. Each episode covers the trials and tribulations of starting a sustainable business. The Fizzle Show is a podcast for creative entrepreneurs who want to earn a living doing something they care about. With new podcasts published each week they take a light hearted approach and aim to help indie entrepreneurs make weekly progress on their business.